Recently, the Belize Tourism Industry Association’s (BTIA) Caye Caulker Branch hosted health officials from the Ministry of Health (MOH) to hold aggressive campaigns regarding the prevention of Zika. In the neighboring island of Ambergris, San Pedro Town is also on board to fight the virus. Zika, which is a virus transmitted by an infected female Aedes aegypti mosquito, was declared a global epidemic in 2016. After an initial outbreak in Caye Caulker, the SPTC took all the prevention measures to ensure that San Pedro had a defense plan. With the dry season in place, the San Pedro Town Council (SPTC) is prepping to restart its efforts in eradicating the virus. In 2016, Belize was the last country in Central America to report Zika. When the first case was confirmed in April 2016, the SPTC held informative trainings, introduced campaigns, and began vector disease control. San Pedro still recorded seven cases of the virus, with others suspected but not verified. Since then, San Pedro’s Health Inspector, Horris Patten has confirmed to The San Pedro Sun that there are currently no relevant cases of Zika on Ambergris Caye. “In 2016, we only knew of seven cases of persons had contracting the Zika virus. We practiced all of the necessary measures, treated the persons, and provided the infected with mosquito nets. I believe that helped in reducing the outbreak to spread further. I can say that we are currently Zika-free at the moment,” said Patten. Even though the Zika virus infection rate in San Pedro is on the decline, the SPTC still continues reactivate vector disease control. 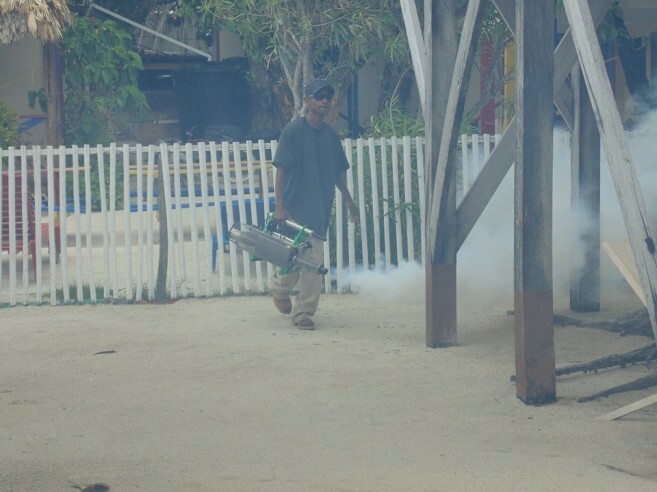 “We as a Child Friendly Municipality and a Town Council have taken the initiative to sponsor several campaigns, and assist vector control teams to conduct house spraying to alleviate mosquito borne diseases. Although the Pescador fire and Hurricane Earl were unexpected, we are refocusing on starting our campaigns and spraying for this New Year,” said Jorge Aladana of the SPTC. He further stated that the SPTC supports mosquito eradication, and the council spends roughly $100,000 annually for vector control. “When you look at the vector control, the SPTC spends $100,000 just to assist the MOH yearly. We even provided our public health inspector with a golf-cart so he can have transportation while conducting these campaigns. We do not have our own vector control team, but they mobilize from Belize and come to San Pedro. The SPTC provides transportation, lodging, and even food. During the rainy season (June to November), the SPTC pays for the workers to do fogging in cycles. They either do it at dusk or dawn for three days straight, every seven days. However, if it rains, it interrupts the cycle,” said Aladana. According to Aldana, not having the constant interruption of rain is one helpful factor in good vector control, but educating the public is the most important. The SPTC’s Clean-Up campaign’s message to clean up your yard also plays a major role in alleviating mosquito breeding sites. “It doesn’t make sense for us to continue spraying if we don’t change our behavior. The most effective way to combat any mosquito borne disease is behavioral change. We can have all the wonderful campaigns, the MOH can do its part, and the SPTC can use their resources, but if you don’t change your behavior, all of our labor efforts go in vain. We always encourage people to clean their yards, especially garbage that can hold water,” said Aldana. A simple bottle stopper can harbor hundreds of mosquitos, and can spread any mosquito borne disease. Therefore, the SPTC urges the entire community to cooperate and get rid of potential breeding sites by destroying stagnant water in yards. Aldana stated that the SPTC and the San Pedro Police Department have granular abate pills at no cost. The pill is thrown in contaminated or mosquito-infected water to kill the mosquitoes. The SPTC it will continue to partner with various community events to educate the public about Zika and provide prevention resources. The Department of Health reminds residents that Zika is still in the territory, and encouraged everyone to continue taking precautions to prevent infection. The most common indications of Zika include: mild fever, skin rashes, red eyes, muscle and joint pain and headache. At the moment, there is no specific treatment or vaccine available and the best prevention is protection against mosquito bites. Health officials recommend the use of condoms or abstinence as Zika can also be transmitted sexually. 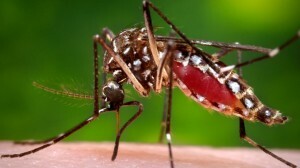 For those residing in affected areas, travelers, and pregnant women should prevent mosquito bites at all costs. By covering exposed skin with long-sleeved shirts, pants, and hats, one reduces the risk of becoming infected. The use of repellents and sleeping under mosquito nets are strongly advised by health authorities. If you or someone you know have symptoms of Zika or if you are an expecting mother, please visit Dr. Otto Rodriguez’ Polyclinic located at Manta Ray Street or call 226-2536 for further assistance.